An installation wizard guides you through the steps necessary to enroll and use the biometric reader with the PC. First, you enter your Windows password, and then scan your fingerprint in order to associate the two. Once the device has been registered, logging in to Windows is a breeze. All you have to do is swipe your finger and Windows automatically detects the reader. Biometric login is as easy as that. 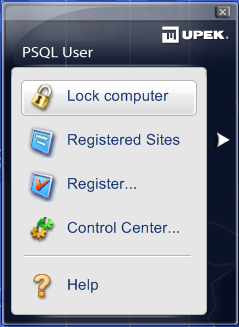 The system allows for multiple users to be registered on one computer. When multiple users registered, the computer automatically logs in the user presenting their fingerprint. The Eikon can be used for fast user switching when someone else is logged in. If you can master the “biometric slide,” then this strong authentication device can help keep your workstation secure. My challenge from the beginning was to get a good, readable swipe of my finger. I learned that it has to be slow and controlled motion … not too fast and not too far to the right or left. It may take a bit of practice, but I was quickly getting reliable reads on first attempts. For some users it may take several attempts to log in, but if security is what you are looking for, then this is a great affordable compromise. The Password Bank allows users to program the Eikon to be used in conjunction with password-protected websites. Registering websites is fairly straightforward. From the web browser, you swipe your finger when you are at an account login screen. This launches the Biomenu applet. Select register on the Biomenu and enter the username and password as normal. When you return to the login page on the site in the future, a swipe of your finger will automatically log you in. The Protector Suite QL with the Eikon reader has many other add-ons or options as well. Users can encrypt file folders that can only be unlocked with their fingerprint as well as associate a finger to an application so that when you swipe your pinky finger it automatically launches your favorite game. “The Eikon does all of its processing in the reader, so the fingerprint image and the algorithm never use the computer for processing,” said Mr. DeGonia. This limits vulnerabilities where attacks could occur within the external PC or networked environments.